Altitude range: 2800-3400 metres above sea level. 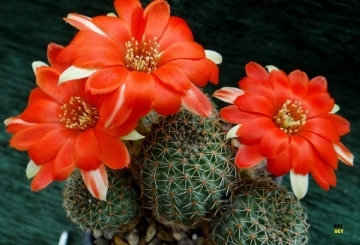 Description: Rebutia huasiensis is one of the innumerable local form of the variable Rebutia pygmaea with dark green stems and lots of orange-red blooms. Peculiar of this plant is the colouration of the external rows of petals that are often white (or greenish) or stripped in white. Remarks: Rebutia pygmaea is a very small clumping species, widespread and extremely variable. Some of its variable forms don't really look like the same species. The vast amount of phenotypic variation in the species has led to the erection of several variants and has received numerous unnecessary names of controversial botanical value: Rebutia huasiensis is one of them, but it still has a value for a collector because they identify plants with particular characters. Habitus: Often solitary in nature it may form groups in cultivation. Stem: Spherical to short cylindrical, up to 30 mm in diameter (or more in cultivation). Epidermis dark bluish-green. Ribs: Rib divided in small tubercles forming spirals. Tubercles round, about 4 mm long, 2-3 mm high with a 6-polygonal base. Areoles: 2 mm long, brown tomentose. Root: It has a juicy succulent taproot. Radial spines: 7-9, symmetrically arranged, addpressed or protruding, thin, short, 3-5(-8) mm long, at first brown with darker tip, later greysh. Flower: Vibrant carmine-red, about 4 cm across. Inner segments orange-red with a slightly purple-red mid-strip and a paler margin. Outer segments white or greenish on the edge. Throat often paler and filaments, pink or whitish. Style greenish, half the length of tube. Stigma green, 6-8 humerus. 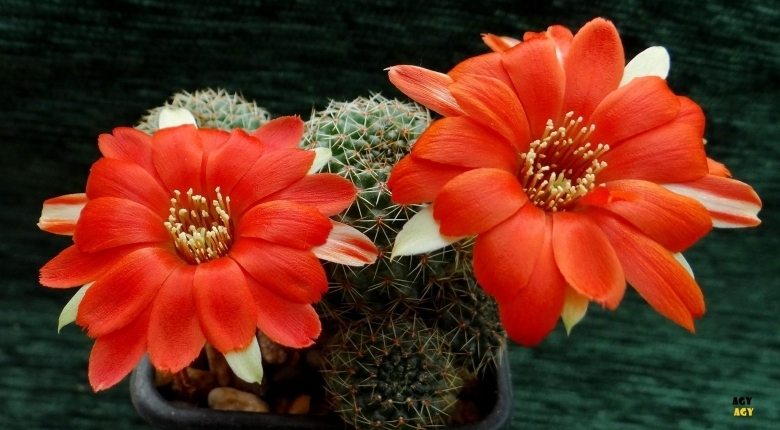 Cultivation and Propagation: Rebutia huasiensis is a summer growing species that is easy to cultivate and recommended for beginners. The whole Rebutia pygmaea complex has delightful flowers and the plants remain compact, and clumps can easily be managed by division. Another advantage is that the plants are very cold hardy in Winter if kept dry.